This review is for the B&W 805S, the upgraded model made in 2005 after the famous 805 Nautilus. I use them with a solid state audio system, all Audio Analogue. First of all, an advice about the stands....B&W sold for these speakers a pair of very nice stands, made by aluminium and cast iron;the problem with these stands, even if the central column is filled with silver sand and lead shot, is that they muddy lowest frequencies and make the voices somewhat grainy and harsh, with gritty sibilance. I tried every possible tweak with them: blu-tack or spikes or sorbothane between the speaker and the top plate, brass cones for the base, add Dynamat,etc... but just putting the speakers on a rigid and lightweight stands like the Solid Steel the sound improve, especially in the critical range of the voices and the lowest bass. Now the sound is less thick and the soundstage shrink a bit, but the timbre is much more smooth and linear, no doubt about that. So my advice is.....forget the original-expensive-just beauty oem stands and take something like Sound Anchor. For the sound of the speakers: they love amplifiers with smooth high frequencies and plenty of power in the bottom....the kevlar cones can eat a lot of watts without distortion, really. The kevlar mid-bass recreate smooth and articulate medium-low frequency, with very good sense of the rhythm in the regions of acoustic bass and rock drum; the lowest bass (under 50 hz) obviously is not on the agenda here, it is a bit overdamped (see reflex measurement on Stereophile or italian Audio Review n.267), but, for the speaker's size, is very good, always clean and fast. The medium frequencies are the best part, honest, detailed but naturally smooth. The tweeter is improved respect to the 805 Nautilus, the aluminium resonance is now at 30 Khz, the sound is sweeter and more detailed, but the diamond dome is on another league IMHO. Some other advice: 1 - in the manual b&w advice to connect the jumper terminals to the lowest connectors for better sound in the case someone is using the speakers in monowiring configuration, but I noted in two different systems that when reversing the jumpers to the highest connectors, the voices are more coherent. 2 - often, but not always, I noted that these speakers prefer copper cables to the silver ones. Amazing speakers. Waited and saved for so long to get a second hand pair for approx USD 1000 and blown away by the details and clarity this speakers provide. I had 602 s3 and this was my favourite speaker but due to damage I had to upgrade to 685's. Since then I felt that I need a sub as something was missing. Having the 805n next to 685 s1 has confirmed that older 805 is a class of it's own. Silky trebles, accurate mids and deep controlled bass in such a small bookshelves. Don't get me wrong , 6 series is excellent value but 8 is in it's own class. After the upgrade I disconnected the subwoofer.Really don't need it. 805's respond to 34-36 Hz , I've tested using the tone generator. I listened to them 1st in big room on emotiva amp and now playing in medium room on CA 740A. Maybe I'll upgrade amp next time. For now it plays great and 2x100 rms seems to be sufficient power for them. If you still can find a good pair ,IMHO do not hesitate to buy. The B&W 805 speakers are my studio-mix speakers of choice. Using a Studiomaster P7 24ch. board, Crest V1100 amp and MIT cables the B&W's provide the perfect tonal characteristics for virtually every sound system my mixes are played on. (This is no compliment to me but to the speakers' trustworthiness.) The presence of the instruments sounds like your just a few feet away, unlike most speakers where the presence of the instruments sounds like they're forty feet away. —And some times they even sound like they're back stage : ^ ) But the best compliment I can give to the B&W 805's is that every style of music: from classical (piano and symphonic alike) and jazz (standard and fusion alike) to rock and motown: all sound balanced, musical, even caressing with very minimal listening fatigue. Even the famed Dynaudio speakers don't caress the acoustic nerve the way the 805's do. I've been in million dollar studios where the most expensive speakers were used for the mix. And while it sounds great in the studio, once you hear the performance on consumer grade equipment it becomes a crap shoot whether the EQ will balance out. More often than not it doesn't. Again, the B&W 805's virtually fit anywhere on any system. I could compliment these speakers all day, but I appreciate the proverb, "Shut up before you think you're half way done." This speaker has been a love/hate relationship for me. I can only conclude that what people say about feeding this thing with the right frontend, seems to be very very true. I have found that every change in my system has had a profound effect on the result produced. I used to have to b&w 601 and provoking a different result by changing a component in the front end was clearly possible, but it was nowhere near what the situation as with the n805's. So after going through 4 different power amps, 2 preamps and changing out signal cables I have landed upon a result that is vastly(!) different from what I started with (Yes every cables, power and pre amp swich all brought substantial change). I'm not so sure you need an expensive frontend, actually I'm quite sure that the wrong expensive frontend could be quite horrible. I heard it sounding quite nice with a German Grundig integrated :-) However hifi amps from Copland and Quad were not the ticket for me. I will advice you to be able to try this speaker in the configuration it's going to play in before committing, If you can't do that you should be prepared that you might need to do a lot of experimentation and changing out of equipment till you get great results. Mine have gone from being over analytical, lean, cold, tinny, harsh, uneven bass and fatiguing (I almost wanted to cry when I got home and my non audiphile dog and girlfreind both ran and hid when the system played) to being balanced, slightly warm, much more, even, tight and full bass and without any harsh/iterating treble. But it's been a long road. Actually it now has the ability to certainly dissect the music, but is very musical and quite forgiving of lesser records. Amy Winehouse "Back to Black" still sounds awful - so there are limits :-) But old dodgy jazz recordings, some of the lesser Ella and Sinatra, 70’s soul records, Elvis Golden records and something like Radioheads "In Rainbows" all sound great. And of course audiophile recordings shine. By the way I was a professional performing and recording musician and music composer/producer in my former life and thus have tons of reference from playing and recording music ranging from acoustic jazz, rock, pop, folk and electonic music. I owned full range huge speakers previously and never knew that I can be blown away by bookshelf speakers. 5. Superb airyness and I can hear air and ambience in the singer and instruments creatin a palpably real and deep soundstage. I use a home made tube pre power and I was stunned what this speaker offered me. The sweetness and clarity and soundstage makes me think back of bookshelf though I am a floorstander lover. Solidly made, fantastic sound, incredible engineering went into them. In my opinion, the best bookshelf speakers out there if paired with very good electronics. Must be used with high quality electronics. They are very sensitive to the acoustics of the room you are in. If there is a lot of reflections or if dimentions are multiples of each other (8 by 16 for example), you are not going to be happy with these speakers. Also, to get the most out of them, make sure you bi-wire or the bass will be very flat. I really didn't think this would matter until I tried it both ways. I can't say enough about these wonderful bookshelf speakers. For the money, and I know they are not super cheap, one would be hard pressed to find better. On many occaisions I have AB'd the entire line of B&W Nautilus, N802s and higher were clearly better but only if used with high wattage amps. As much as I wanted it to be true (so I could upgrade), the 804s, 803s, and even the new diamond line left me unimpressed when compared to the 805s. Clearly you are not going to get great base extension with bookshelf speakers and I feel this is their only limitation. The bass they do produce is tight and convincing. Detail is excellent as is imaging. The overall quality of the front end and amp are critically important. The weakest link in your system theory is sadly very true. I don't want to sound like an audio snob here, but if someone trashes a high end component and lists any box store receiver as their source of amplification take it with a grain of salt. Really any electronic component that you can buy at Circuit City or Best Buy is not going to do these speakers any justice. If you really want to try some good entry level higher end gear at a nice price look into Rotel or Adcom. Want to go better, try Arcam. Thinking about that 2,000 dollar Onkyo or Dennon reciever, consider an amp/pre-amp from Rotel for the same price. Better yet, go on EBAY and get some used stuff. These higher end component almost never break. Don't go cheap on cables!!! no you don't need to buy 1,000 dollar Kimber's. I use Tributaries and Straight wire... sounds fine. Even the high end monster cables are good. Beautiful sound, stunning looks....what else would you need in a speaker. Need a sub for most music and home theater use. I had used Polk Audio RT200i's for a couple years when I had a chance to switch to a full B&W surround setup: CDM-7NT mains, CNT center, 601S rears with an Aperion Sub. I was immediately hooked on B&W's. So much so that I immediately commenced a quest to upgrade to B&W Nautilus series mains. After focusing on Nautilus 803s and 804s, I jumped at an eBay auction for N805's, HTM2 center and an ASW-2500 700W sub. Got the whole set for $2500.00. I'm absolutely in love with this setup...especially the 805s. I drive them with a SONY "ES" DA777ES Receiver (120W/ch) and find that this receiver's power is much, much more than adequate. How do the 805s sound? I'm not going to comment on soundstage, openness, brightness, muddiness, imaging and all the other cute words some reviewers here insist on using. All these factors are determined as much by the media you are playing, your amplification equipment and the characteristics of your personal listeming environment. In my family room these 805's sound just awesome...but in your room they will sound different...surely still awesome, but different. 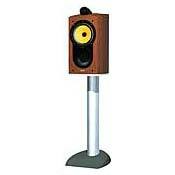 I've used the following brands of speakers through the years: Sansui, Klipsh, Bose, Yamaha, Wharfedale and Polk Audio. To my ears, on my equipment and in my listening room, these 805s sound better than any speakers I've owned. Am I an "audiophile"? No. I don't want to spend enough money on audio equipment.to rate that title. However, I like good stuff and the 805's, to me, certainly qualify as good stuff. I use the 805s on Sanus stands. I would never pay $600.00 for B&W stands...surely good equipment but not a good value at all. How do the 805s look? Well....I have yet to have a neighbor or friend come into my family room without immediately noticing them and demanding to hear them while they wipe the drool off their chins...yes, they are visually unique and gorgeous!! My only possibly negative comment is that I find that these speakers need a powered sub. But, I believe that B&W intended the 805's to be complimented with a sub. And, without question, a sub is required for Home Theater use. Beautifull, sound stage, and dimension. None considering they're a bookshelf speaker. I have owned these speakers since 1999 and decided to write a review after recently upgrading my system. I was always told to invest first in speakers, and that's what I did. Along with the 805's, I have a center Nautilus HTM1. Not to bore you with history and the equipement driving the speaker, but the equipement makes a HUGE difference. I originally ran these speakers with a mid 1990'2 Carver 405-5 channel amp. Speakers did the job with Sunfire's sub. I then stepped up to Denon's clasic AVR5600 140 X 5. Sounded even better. I then upgraded do to reciever problems and found a great deal on a new Sunfire Signature 200 X 5 amp. To save money, I am using Marantz's AVR SR7500 as a pre amp. I could not believe the diffence in sound with the new pre-amp/amp combo. The sound is seamless in the front and center channels, and the output is amazing. Vocals is the 805's strongest point making it sound as though the artist is in the room with you. Just remember, your speakers are only as good as the equipment driving them, though the B&W's performed well with the various amps that have driven them.